There are several advantages to running after the sun has gone down. For a start, during the summer months, not only will the heat have eased off, but so will the evening rush hour and the poor air quality that accompanies it. There’s also a certain tranquillity about the more laid back atmosphere that can transmit itself to the runner and make for a more enjoyable, fulfilling exercise session. Of course, the reason why you are on the move in the dark may be for more practical reasons: those with a more conventional working day may find that this is the only period where they are free to clock up some miles; city-centre dwellers may prefer the less dense early evening pedestrian traffic on the pavements to the hustle and bustle of the urban experience during commercial hours. Whatever the reason why you are heading out in the dark, it is important to remember that the relatively restricted visibility and the presence of less people on the street or in the park means there is more likelihood of you running into trouble, whether that be the unwanted attentions of casual troublemakers or those specifically in the area with the aim of either attacking or robbing vulnerable individuals. These potential threats apply to male and female, young and old: don’t assume, for example, that because you are a supremely fit, muscled young male that you will be immune from attack – in the minds of cowardly individuals, the use of a weapon can more than make up for a lack of physical prowess. Then there is the issue of road traffic and evening cyclists in the park. Both types of vehicle are likely to come off better than you in a collision. This type of incident can happen even if the driver or rider is paying attention to the road ahead, and is more likely to be the result of the runner being difficult to make out in the evening gloom. So how to protect yourself from man or machine? Well, first of all, make yourself as visible as possible through reflective clothing. Not only will this make you easier spotter from behind the wheel or the saddle, but potential attackers will feel less confident of committing a crime and making good their escape if their victim’s struggles or distress signals are likely to be seen by other members of the public in the vicinity. Many running shoes incorporate reflective strips, and these can be supplemented by jackets, vests, shorts, and ankle bracelets that alert others to your presence. Take care when planning your evening route to ensure it does not include dark passageways or areas of heavy vegetation that can provide the perfect cover for an attacker. Remember, too, to tell someone that you are going for a run and when you expect to return, in order that they can alert the relevant authorities should you fail to appear. Preparing for the worst can also include seeking out fellow enthusiasts to recruit as running partners, and purchasing a distress whistle to alert others to your predicament. Talking of loud noises, leave the DAB portable radio or iPod at home. Not only will the music player remove your ability to hear approaching traffic or a cycle bell, but it will mean you won’t be alert to the sound of approaching footsteps or the rustle of bushes that may be the prelude to attack. 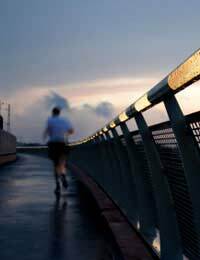 While no one should feel intimidated into abandoning evening runs, it is essential that all precautions should be taken when exercising at this time of day. These safety steps will provide the peace of mind to allow you to get the most out of your running.